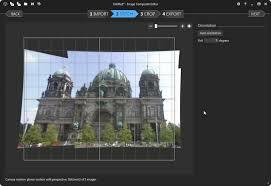 The best free tool available to create Panorama is IMO ICE, Image Composite Editor, from the Microsoft Research Lab. Not only it's able to join pictures, but it's also auto-completing the gaps !!! It can even create a panorama from a panning video. There a 4 steps: Import, Stitch, Crop and Export. For simple panorama, go directly to step 3. Click on "Auto Complete" (top-right of the screen) or on "Auto Crop". The result with "Auto Complete" is amazing. Click on step 4, Export, to save the result. In order to hide my NAS, I wanted it to use its own VPN, while my public IP was still visible when surfing with any other devices in my LAN. To do so, I subscribed to HMA! (HideMyAss!) and applied their configuration procedure on my Synology. Et voilà. Although using Port Forwarding to access my NAS from internet, I did not had to open the required ports !!! If you are using a DDNS, go to the Control Panel > External Access and Click Update to verify the public IP of your NAS. It must now be your VPN IP. Check that downloading a torrent (with this procedure), your tracker IP is your VPN IP. Check you IP calling ipify from your NAS. Soon after enabling the VPN, I started to be attacked on Telnet port! I am using Security's Auto-Block feature to prevent brute force attacks. On a mobile device (or anything else) connected directly to Internet (not via your LAN), type your VPN IP in a browser. You should see the default home page of your web station if this one is enabled. I would recommend to replace this default page by a php page returning a header 404. If you are using a DDNS on your NAS, you won't be able to access your router and VDSL modem via that domain name. Indeed, only your NAS is accessible via this VPN IP. If possible, configure another DDNS on your VDSL modem or router. Ex. : I am using duckdns.org for free. They have a great support page here with detailed configurations for many different devices. Doing so, you can access your NAS and your router or modem via their own Domain name. This is a problem which comes back regularly when updating drivers. Each time, I wonder what's wrong again. So, here are some tricks to find the cause. Put the computer at sleep and wait until it wakes up. Vendor 0x046D is Logitech Inc.
Go into the Device Manager, find that device and open its properties. In its "Power Management" tab, disallow the device to turn on the computer. If the option is not available, this device is not causing your issue. If your PC has been waked up by the Ethernet Controller, it can be because any packet can wake it up. In the Power Management tab, tick the option "Only allow a magic packet to wake the computer". Open the "Event Viewer" (eventvwr) > "Windows Logs" > "System". The system has returned from a low power state. Open the "Task Scheduler" and find the task mentioned by the command above. In the tab "Conditions" of that task, disable the option "Wake the computer to run this task"
Open the "Power Options" > "Change plan settings" > "Change advanced power settings". Under "Sleep", disable "Allow wake Timers"
Open "Change Automatic Maintenance settings" and disable "Allow scheduled maintenance to wake up my computer at the scheduled time"
I just discovered that I was not able to access my NAS anymore from internet. The problem was that I did re-enabled the Wifi by accident on my Vdsl modem. Tthe DHCP server gave unfortunately the first free IP of the IPv4 pool to "an unknown Wifi device" instead of assigning this IP to my router as it used to be the case in the past. Port Forwarding from internet to my router, defined using that first IP, couldn't work anymore. I just did assign a static IP to my router in the Vdsl modem's DHCP server settings (and re-disabled the WiFi). I did reboot next the router. I noticed that between 50GB and 100Gb of my Internet Quota was consumed per day since two weeks. After investigation, I found it was due to the Cloud Sync service of my Synology Nas "looping" infinitely. The first step was to identify the device downloading some many Gb per day. I did enable the logging service on my router and turn on the logging of its firewall for all outgoing connections. I did export the log of the firewall into notepad++, cleaned up a bit the log to keep the source and destination IP only. I did copy that into Excel and created a pivot table to see which source was doing many connection and onto which external IP (eliminating known destinations as the DNS of google 8.8.8.8 and 8.8.4.4, the Synology's KeepAlive service 118.163.30.162, Broadcast 192.168.0.255, ...) I saw that most connections were onto 172.217.16.193, 172.217.21.202, 172.217.22.42, ... from my NAS. Using a IP who IS service, I found that 172.217 belongs to Google. Why was my NAS connection to Google ? I did look all the packages installed on my NAS and "tilt": Cloud Sync was configured to sync two google accounts... Having a quick look into the current status of Cloud Sync, I noticed it was "syncing" 1 file... apparently for ever. Dec 10 11:19:26 [ERROR] gd-transport.cpp(2195): error reason: [rateLimitExceeded]. Dec 10 11:19:26 [ERROR] gd-transport.cpp(2196): error message: [Rate Limit Exceeded]. Dec 10 11:19:26 [ERROR] gd-transport.cpp(2238): Hit rate limitation.